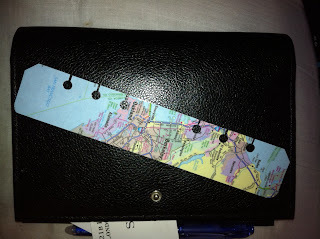 Last week I wrote about making your own diary layout if you couldn't find one commercially available that you liked. I also made available a PDF file of my 2012 layout. Today, I am making available the source files so the more geeky of you can have a play. You'll need this excel file which does all the hard work. You can adapt this to give you any date range you want; simply change the dates in the first column. Have a look at the formulae, which mostly extract elements from the date and are relatively simple. Over towards the right, though, where dates are calculated for the mini calendars, there are some more complex formulae. Importantly, these columns must stay formatted as text, even though the data are numerical in nature; otherwise Word can't cope with them properly. Speaking of Word, you can also grab the layout template I merged the data into to make my layout. You can adapt this to produce pretty much any layout you could imagine, then merge into a document you can print and punch. A couple of words of warning, though (pun semi-intentional). Firstly, depending on what version of word you're using, Word may put section breaks between every record, which will throw out the mirrored gutter formatting in the format. If it does, the solution is quite simple; do a find and replace on section breaks (^b) to remove them all. You'll also need to add a single page break to the front of the merged document so that a 2-day spread has gutters in the middle. Of course, this isn't an issue on 1-page layouts. You might also need to adjust the top and bottom margins until print preview confines the layout properly to single pages for your printer. That's it really. If you want to roll your sleeves up you can create the perfect layout that is unique to your own needs. And you need never pay for a diary insert again. Switching mid-year? No problem. Your pages can start and end on any date you like. The hardest part was building the Excel file that serves as the data source for the Word mailmerge. Have a look closely at the top of the left hand page: yes, those mini-calendars are dynamic and will always show the current month plus next month. The formulae that feed all those numbers are non-trivial, but in another part of the collection of odd jobs I call a career, I'm an Excel developer, so it was an interesting challenge. 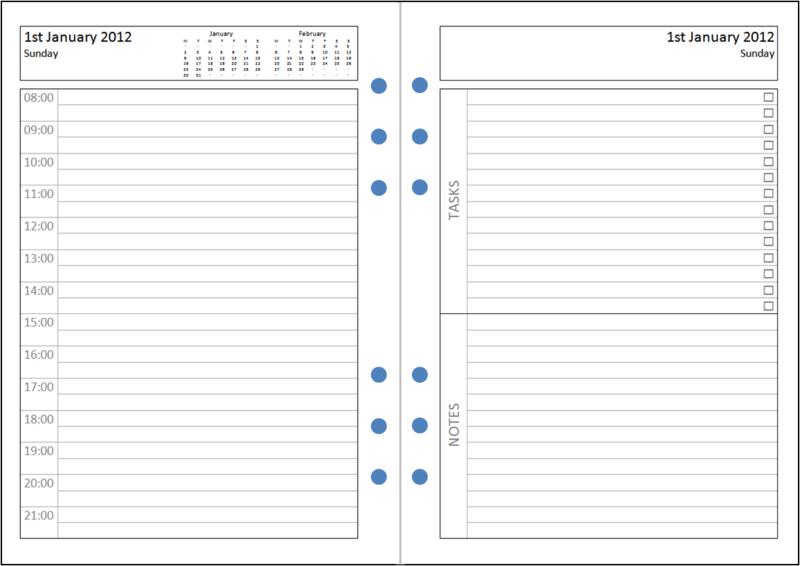 Print this on a duplex laser, punch it and you have an A4 diary. 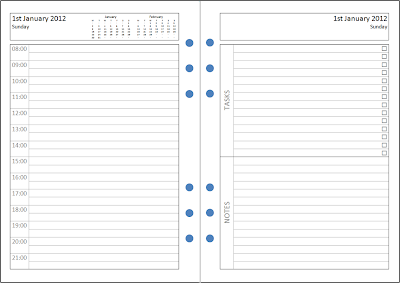 Mine is A5, so I print this in duplex booklet layout and then guillotine the sheets and voila: an A5 diary, the way I want it. Once I get file hosting sorted out and playing with Blogger, perhaps I could publish the source files, or at least a PDF. Let me know in the comments if you're interested. Also, now the heavy lifting of the Excel file is all done, developing different custom layouts in Word should be pretty easy, so let me know in the comments if there's a layout you've always wanted. No promises, but I might be able to produce something that works for you.